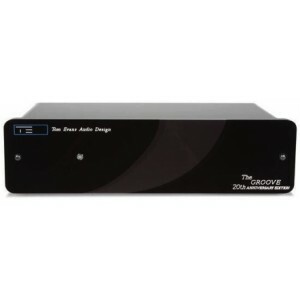 The Tom Evans Groove 20th Anniversary Edition is a supreme quality phono stage, from analogue expert Tom Evans, and features improvements and upgrades on the older Groove and Groove Plus phono stages - both designs which earned acclaim among audiophiles. The Anniversary edition offers an external Lithos power supply, as well as a cartridge loading PCB which is adjusted with plug in resistors. Ideal for matching with any cartridge, the Groove 20th Anniversary Edition is also able to cater for low output Moving Coil (MC) cartridges with outputs as low as 0.2mV. The Groove 20th Anniversary Edition is configured at the factory for gain. The unit is completely customisable and adjustable should you change cartridge. The Groove 20th Anniversary Edition phono stage continues Tom Evans' tradition of unique, ultra low-noise components, which value sheer musicality above all else. The use of Lithos voltage regulators is a common theme throughout his components, selected for their low noise levels and lack of case resonance thanks to the use of non-metallic casings. I recently acquired my Mk2 version of this phono stage which is truly amazing and even though my hearing is not as good as it was I am still able to hear SO MUCH MORE detail but in a balanced , musical and natural way. TRULY AMAZING! Tom Evans is a genius.